When researching the best toys for 6 year old boys, we took into consideration where your little guy is at in his childhood and development. He’s becoming increasingly independent and wants to do even more things on his own. His social skills are developing at a rapid pace as he spends more time with others outside your immediate family, such as with friends at play dates and teachers at school. But the things that don’t change are his boundless energy, his quest for adventure and endless curiosity. We kept all those things in mind when creating our hand-picked list of the best toys for a 6 year old boy. This Razor FlashRider 360 is an awesome 3-wheeled ride on toy that will have your 6 year old boy spinning, sparking and cruising around the neighborhood in style! The dual inclined rear castor wheels are one of its many cool features and they allow your child to spin 360 degrees and drift smoothly, all in comfort and safety. Its sturdy design include a welded steel frame and fork and a high impact front wheel that’s resistant to flats. This cool ride on toy is definitely built to last! But what many kids consider to be the coolest feature of the FlashRider 360 is the spark bar. With a pull of the lever the bar drops and the sparks fly! And the spark bar cartridges are replaceable (sold separately) which means there’s no end to the spark-throwing fun. The FlashRider sits low to ground which makes it more stable and helps prevent it from tipping over when your child is making quick turns. Plus the bucket seat means your child will be pedaling when he’s reclined, making it very comfortable when riding for long periods of time. The handlebars come equipped with rubber grips for added comfort and to help protect your child’s hands. 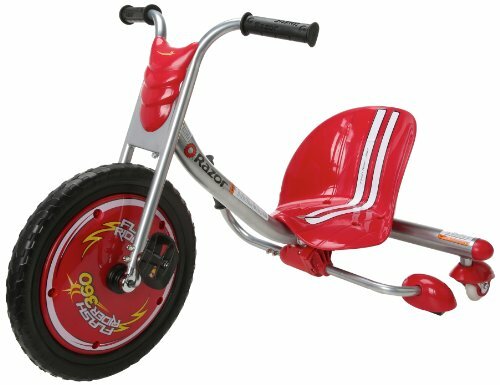 This flashy red and white kids trike has a weight limit of 160 pounds, so even adults can take join the fun and take a spin! Kids go absolutely bonkers for the spark bar feature! This Scientific Explorer Magic Science For Wizards Only Kit is a fun science kit that masquerades as magic. This cool kit includes some ingredients, test tubes, scoops, 2 different colors of paper an activity guide and more. There are 9 magic tricks in all and each one of them uses everyday household items such as vinegar and baking soda that can easily be replaced when they run out. This unique combination of science and magic helps teach your child about different chemical reactions and allows your little wizard to make a test tube crystal ball, a glow in the dark bubbling potion, his very own magic wand and lots more. And the best part is that all the experiments are easy to do and don’t take much time. The enclosed guide not only explains in detail how to do each trick and the science behind them, it also gives some useful tips on performing the tricks and fun facts about famous wizards. 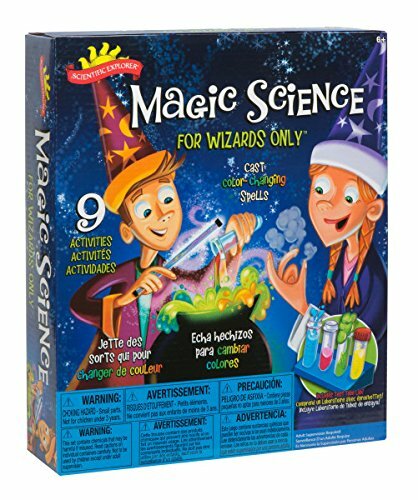 A great little kit that allows your six year old boy to combine the fantasy of magic with the reality of science, while at the same time giving him an understanding of how some “magic” happens. It’s a wonderful gift for any occasion and is wonderful for any Harry Potter fan or as an addition to an existing magic kit your budding magician already has. It makes science interesting for kids! 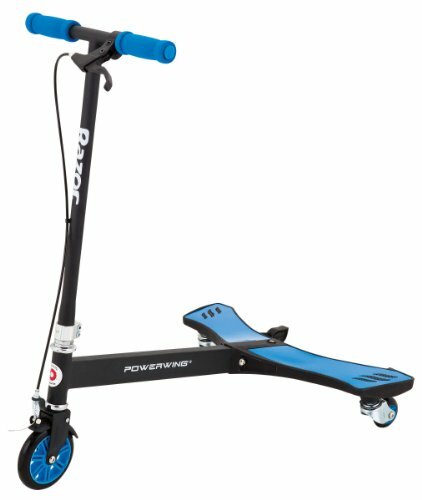 The Razor PowerWing Caster Scooter is an awesome little scooter with cutting edge technology that allows your 6 year old boy to perform radical tricks that will amaze his friends! Once your child gets this scooter going with side-to-side movement, he can hop on and enjoy the ride while he performs 360 degree spins on 2 wheels, side-drifts and spin-outs. How cool is that! With urethane wheels, dual inclined casters and a durable steel frame, this trick scooter is built to last. And the removable stability bars, hand brake and foam grip handlebars ensure a safe, comfortable and controlled ride for your child. The steel deck and state-of-the-art polymer wings are designed to hold a maximum weight of 143 pounds which means that even adults can join the fun! This scooter is available in three different colors and takes about fifteen minutes to assemble. It’s a wonderful ride on toy that is sure to provide your child with years of fun and healthy exercise. It would make an amazing gift and any boy on your shopping list would be thrilled to receive one! With the awesome LEGO Star Wars Snowspeeder your 6 year old can defy the Empire by going to the aid of the Rebel forces! This LEGO building kit of 97 pieces and features a cockpit, a mini pilot and 2 working flick missiles. Incredibly detailed, the pilot is wearing the classic orange Rebel pilot flight outfit, complete with a helmet and a blaster. The kit comes with easy to follow instructions and once assembled the SnowSpeeder measures 2″ high X 3″ long X 3″ wide. A mini version of the attack vehicle that flew over Hoth in Star Wars Episode V, this cool little aircraft is agile and the perfect vessel for your little guy to take into battle. 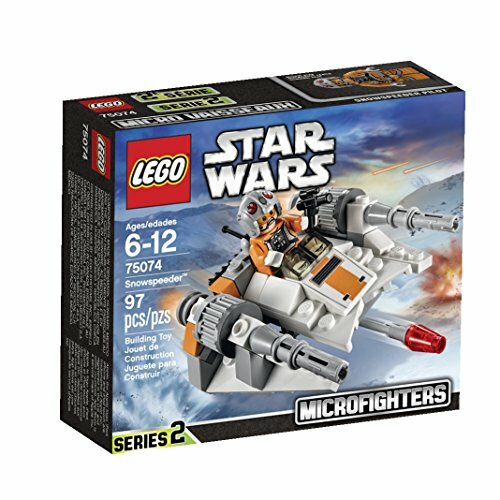 The LEGO SnowSpeeder can be played with on its own or in combination with other micro fighter sets. Any young Star Wars fan would be thrilled with this LEGO building kit! Super fun to play with once it’s assembled! 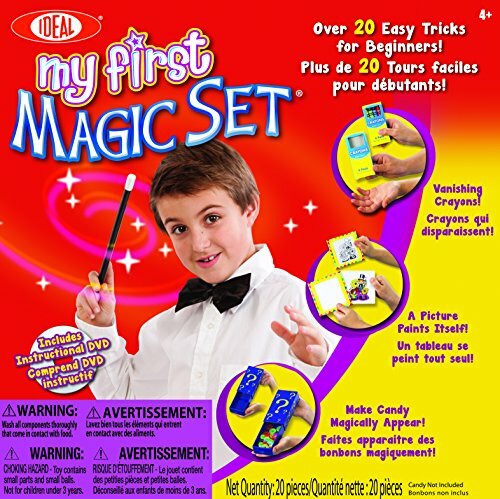 The Ideal My First Magic Set is tons of fun for any aspiring little 6 year old magician! This awesome magic kit includes everything your child needs to perform 20 magic tricks and comes with a magic wand, an instruction book and a DVD. Watch in amazement as your child makes objects disappear and reappear, shows you a picture that changes color all on its own, teleports crayons and lots more. It’s a great introduction to performing magic and the DVD is perfect for showing your child how to perform each of the tricks. Not only will your six year old love learning all the magic tricks in this kit, he’ll also have a blast performing these awe-inspiring tricks for his family and friends. Although there are a number of great magic sets available, this is definitely one of the best magic kits we’ve seen for beginner magicians. 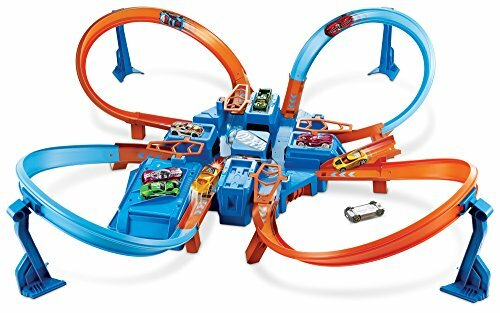 If your 6 year old loves pretend play that involves fast cars and crashes, he’ll go bonkers over this Hot Wheels Criss Cross Crash Track Set! This awesome Hot Wheels track features over 16 feet of track with an elevated figure 8 track and 4 intersecting crash zones. On top of that, it has breathtaking hair pin turns, motorized boosters to help the cars go faster and a super large crash zone for extra thrills. With convenient parking and storage space, along with the track, this cool Hot Wheels set comes with one Hot Wheels car and requires 4 AA batteries (not included). If your child collects Hot Wheel or other small toy cars he’ll have a blast trying out all of his cars on this track to see which ones will move the fastest and crash the best. This Hot Wheels track set would make a wonderful any-occasion gift for that special six year old boy on your shopping list! The Nerf N Strike Blazin Bow Blaster is a cool toy that will give your 6 year old hours of fun and entertainment! This Nerf Blaster looks and feels like a futuristic crossbow so it’s ideal for all kinds of imaginative play. The pull back and launch mechanism is easy and the foam arrows are soft and safe, so this Blaster is perfect for younger kids. It comes with 3 large foam arrows and 2 of them can be attached right onto the bow itself for quick reloading and launching. Although the manufacturer states the arrow can fly up to 40 ft, most consumers said the maximum distance they got from it was around 30 ft. But what it lacks in distance it makes up for in accuracy and that’s why kids love to use the Blazin Bow Blaster for backyard target practice. It’s also great for competitions to see who can shoot the furthest. 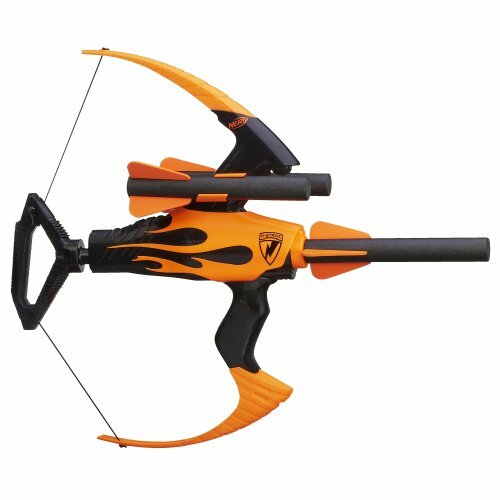 The thing that makes us most comfortable about recommending the Blazin Blow Blaster for younger kids is that the large foam arrows are very soft. So if someone accidentally gets hit by one, they won’t be injured. From playing and reenacting the adventures of Robin Hood to target practice or backyard wars, this Bow Blaster gives your child hours of safe pretend play fun! If your six year old boy is a basketball buff, the Lifetime Portable Basketball System (90040) is a great way for him to have fun practicing his basketball skills at home! 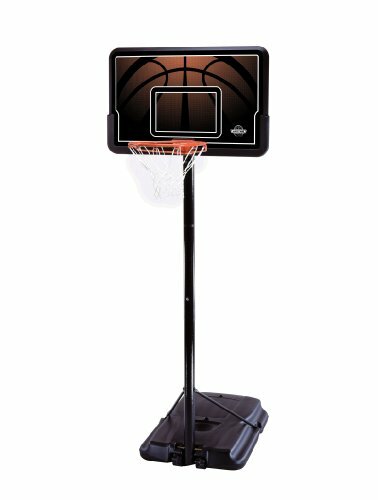 This portable basketball system features a 44″ high-impact backboard made from high density polyethylene. The rim itself is 18″ and is made of solid steel. Both the backboard and rim are designed to be weather resistant so they can be exposed to the elements without being damaged. The adjustable pole is rust resistant and you can raise or lower the hoop in 6″ increments from the lowest height of seven and a half feet to a maximum height of 10 feet. The pole the backboard sits in comes in 3 easy to assemble pieces and the base holding the pole can be filled with sand or water to ensure stability. Plus it comes with a five year warranty. On a personal note, I have very fond memories of playing basketball at different neighbor’s houses growing up. There was always one or two portable basketball systems set up in driveways around my neighborhood and it was great fun to get a bunch of kids together for a pick up game. Definitely one of the most fun things I remember doing in the summer when I was a kid! 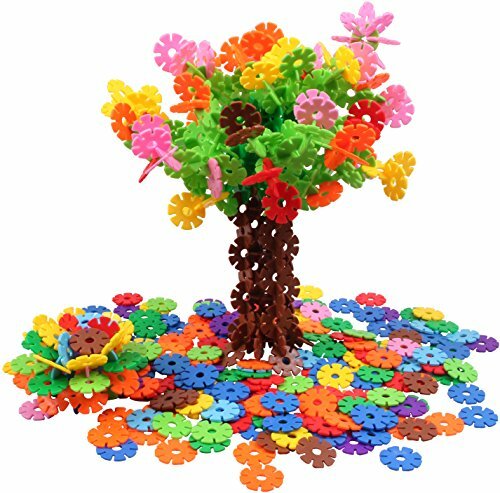 The VIAHART Brain Flakes 500-Piece Interlocking Plastic Disc Set building set is an awesome STEM toy that will give your 6 year old boy hours of creative construction fun! The unique thing about Brain Flakes is that your child can use them to create cool shapes that they can’t make with other types of building blocks. And that’s one of the reasons kids love them! There are 500+ colorful pieces in all and each piece measures about 1.3″. The cool interlocking pieces are easy to click together and take apart and can be used to make animals, spaceships, vehicles and tons more. Brain Flakes allow your child’s imagination to run wild and they’re an excellent way to develop his spatial thinking. They come in a handy storage jar that has a twist top lid with a convenient handle. There’s also an instruction booklet to help your child get started by showing him how to make a Brain Flakes ball. Plus the whole set is BPA, phthalate, lead and heavy metal free. With over 500 pieces, this set is perfect for several kids to tackle individual building projects at the same time. So it also helps teach your child about sharing and cooperative play. This is one of those toys that gives you a lot of bang for your buck! It’s a wonderful way for your child to learn about engineering while having tons of building fun! Kids think they’re a ton of fun and love all the things they can build with them! 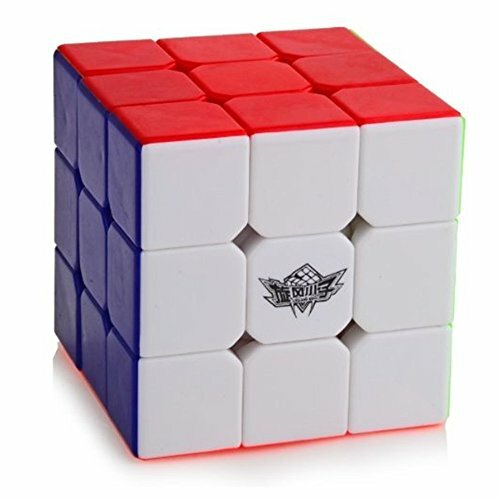 The D-FantiX Cyclone Boys 3×3 Speed Cube is a challenging cube that your 6 year old boy will have fun solving! This brightly colored speed cube features smooth easy turning and amazing corner cutting action. It’s made from ABS non-toxic materials and the tiles on the Cyclone 3X3 speed cube have no stickers so your child won’t have to worry about peeling or flaking no matter how many times this puzzle is twisted and turned. With this awesome speed cube, not only can your child solve the puzzle, but with practice he can amaze his friends with how fast he can solve it! Plus it’s great fun to have timed competitions with family and friends. Designed to be worked quickly and smoothly, the Cyclone makes a wonderful gift for that special six year old on your shopping list. It’s challenging and fun to solve!